How can you get active? The appeal by special leave is against the order dated 11.4.1994 passed under Section 4 of the Unlawful Activities (Prevention) Act, 1967 (hereinafter referred to as "the Act") by the one member Tribunal comprising of BM. Lal, J., a Judge of the Allahabad High Court constituted under Section 5 of the Act, confirming the declaration made by the Central Government in the notification dated 10.12.1992 issued under sub-section (1) of Section 3 of the Act that Jamaat-E-Islami-Hind is an "unlawful association" as defined in the said Act. The above writ petition has been filed in addition to the said appeal, in the alternative, for a declaration that the provisions of the said Act and the Rules framed there under are unconstitutional and ultra vires some of the fundamental rights guaranteed in the Constitution of India. Archives news reports, opinions, editorials published in different media outlets from around the world on 1971, International Crimes Tribunal and the justice process. For the sake of ICT’s legacy this documentation project archives, and preserves proceeding-documents, e.g., judgments, orders, petitions, timelines. 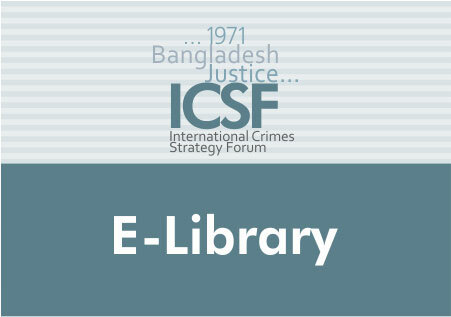 Brings at fingertips academic materials in the areas of law, politics, and history to facilitate serious research on 1971, Bangladesh, ICT and international justice. This archive records from memory the nine-month history of 1971 as experienced and perceived by individuals from all walks of life.